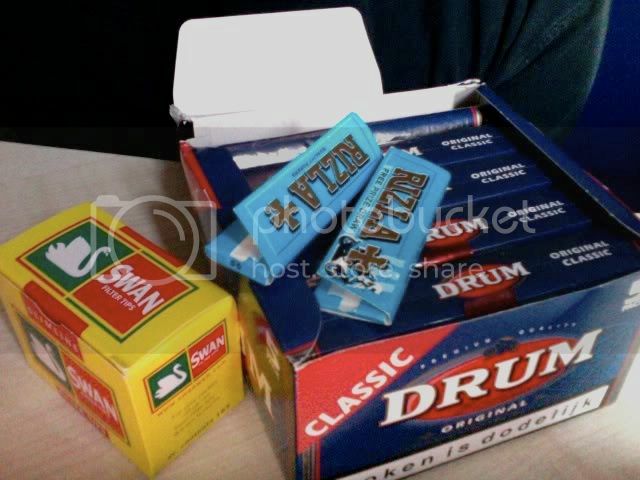 I have Drum Original Classic 5 pack (blue ones) I bought some time ago. I have 4 unopened packs and one just started (only a couple of rollies made from that) but I won't use it anymore at all. The packs are really massive. I also have Swan filters and two Rizla papers (one almost done). I will sell everything for 45. Is it not illegal to sell this 2nd hand? I don't know If it is illegal then I will just throw it out to the bin. So here goes the question: guys, can I sell it or not? I could be wrong, but I'm sure you can't sell alcohol like this, so tobacco could fall under the same remit. Could someone delete this thread? I'll delete it if you want, but you might want proper confirmation on the legality or not of selling on tobacco. I wouldn't just take one person's word for it without providing any references. You're right. Don't delete it for now. I was browsing earlier but couldn't find any useful references for that matter. I will ask around. I mean, the police arent going to come on here, look through this, then arrest you for selling a tiny quantity of tobacco for a tiny price. I was thinking of more of Neil's position rather than the OP. But like I say, I'm not even sure if it is illegal. If it was Golden Virginia I may have contemplated it. I smoke Drum and/or Old Holburn.... I find Golden Virginia too bloody dry! Golden Virginia is okay, I like it quite a lot but always sort of preferred Drum. So who wants to have a quite big pile of Drum? Me, but not at that price. Tobacco's doing the rounds at 6 a 50g, so 45 for 5 packs, one opened is not on. I'll take the 4 unopened for 20 and that's me final offer! Ok, you have a deal for 20. Oh, and from the opened one I basically rolled only one rollie and closed it so if you want to I can sell you all 5 for 25. What do you say? One more thing: Would you be able to come to get it to King Street Exchange on first roundabout on King Street? I'm sorry but I'm not feeling good these days and I don't wanna go out to the city... I would appreciate! I'm not interested in buying but I'm a big fan of smoking conversations. What type of papers people using? green rizlas for me. U get an even burn and they don't go out all the time like the more sought after and praised thinner ones. filter tips? gotta be extra slim swans every time. Can't stand bits of baccy in the mouth. I don't know why I'm finding this thread so amusing. Night shift induced delirium perhaps. Can I just say well done for trying to quit smoking. Well I'm using blue rizzlas and standard Swan filters but I reckon I would like to start using the extra slim ones. What is the actual difference? I'm getting used to all the rolling baccy for uni where I won't be able to afford packs of fags. I use slim swans but I prefer Rizzla silvers, purely because I'm used to using them. And no, nobody likes bit of baccy in their mouth. Bumping the topic. 4 packs for 20.